Located within the settlement boundary of Wrea Green, Preston, the L-shaped site originally comprised of a detached single-storey property, a single storey garage and substantial private amenity space disjointed from the house. The existing dwelling house was located on the shorter side of the site which is raised from the main road and benefitted from view over the surrounding open countryside. The existing Preston dwelling house required major renovation and being of quite tired in appearance a full modernisation programme, remodelling and extensions were undertaken. To the longer side of the L shaped site, the construction of a bespoke, contemporary, sustainable three-bedroom new build dwelling was developed. The concept for the scheme was to integrate the Preston dwelling into the landscape and to maximise the views of open countryside while minimising views into the house from the road. This was complicated as the south facing aspect is to the main road and the north facing aspect is to the private garden area which is less than ideal. The layout was developed to allow a substantial private amenity space and a traditional front addressing the street while reflecting and respecting the immediate neighbouring Preston dwellings. The view from the main road and the nature of the level changes were considered and the massing of the building was developed as a series of interlocking forms, stepping up towards the rear corner of the site closest to the existing massing of the immediate Preston neighbours, with the highest section providing a higher parapet to allow the solar panels to be hidden from view. The massing was also considered in relation to the two immediate neighbouring properties, with the two storey elements contained within a 45-degree angle from the first-floor windows of that property, with the elevations stepping away from the property. 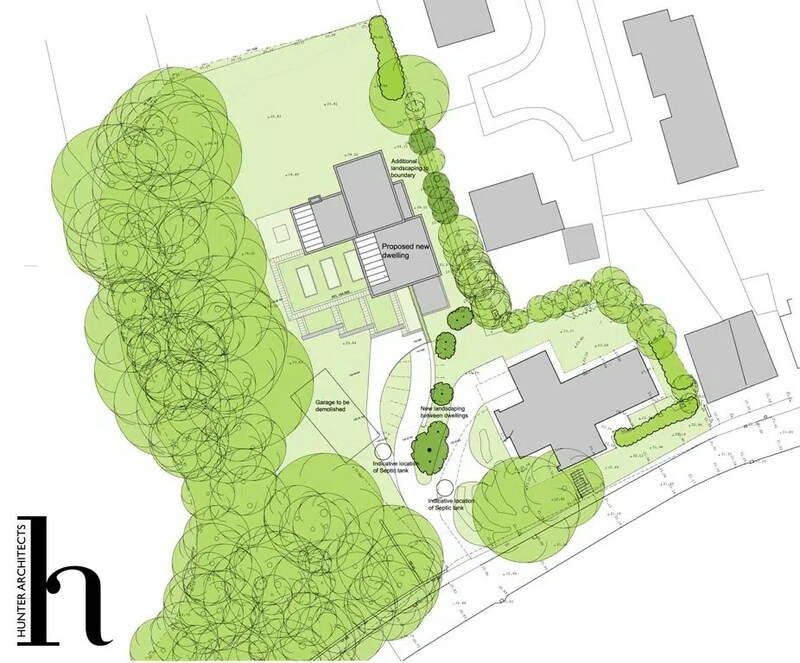 Internally the layout was developed as a large open plan ground floor configuration around a courtyard, with the proposed swimming pool, by Preston Pools, being central to the scheme and being the link to all other spaces. The gym and servicing elements are located to the south with substantial glazing to the west but smaller openings to the front elevation. 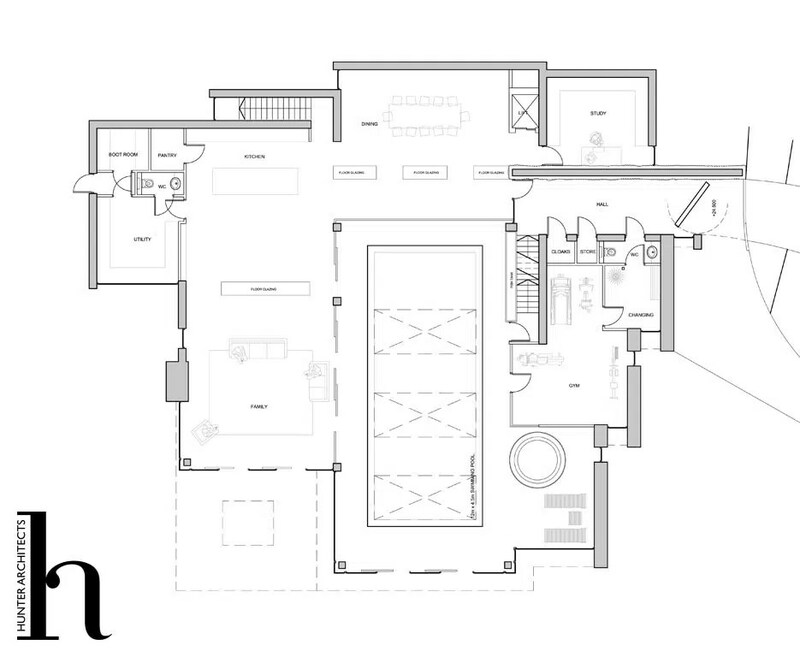 The living spaces are generally on the north side providing a link to the private amenity spaces, with the servicing spaces projecting to the rear. A small study is located towards the front of the dwelling to create a feeling of detachment from the main living spaces. 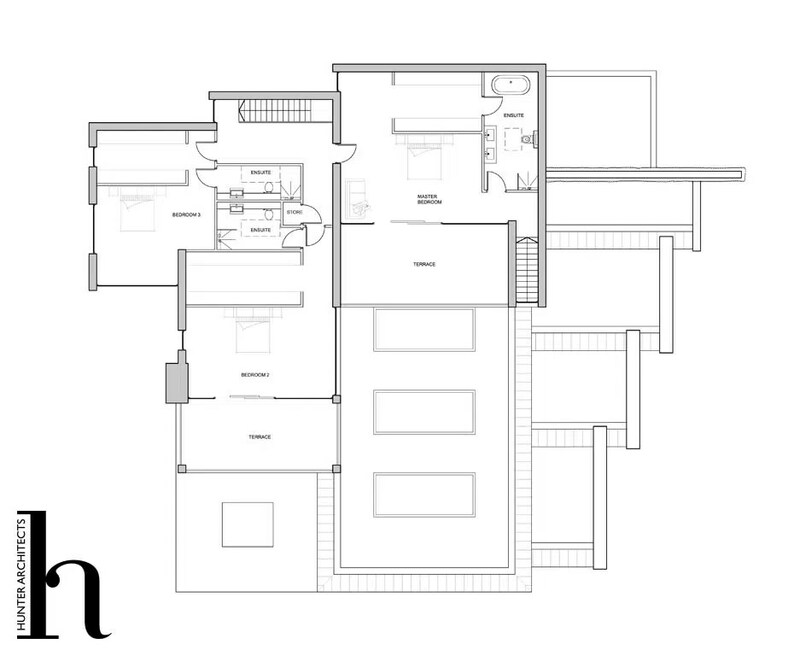 The orientation of the dwelling and location of individual elements creates a series of steps on plan with the south and east elevations generally solid in form, with minimal openings. 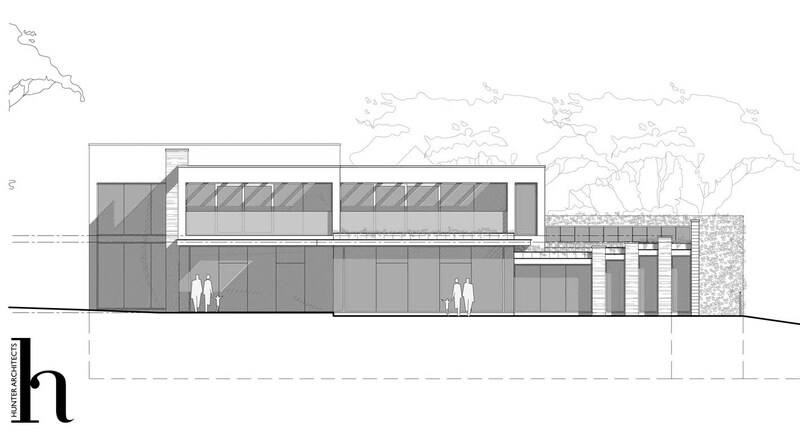 As the dwelling moves around to the west elevation the elevation changes to provide substantial openness in form, with the north elevation being a balance of the two main elevational strategies. It was felt, that due to the level changes across the site and the integration of the landscape into the dwelling that a basement level parking area is providing the best option for parking. The basement level is generally the same as a cutting provides the main road and access to the landscaping. The pedestrian access is configured to be the main focus of the movement, minimising the view of the vehicular access and providing access to the front door on the front public facing elevation. The feature wall, signalling the entrance and extending down into the basement parking area is intended to be a living wall which will feature full height planting and extends into the hallway of the dwelling. The hallway will have a glazed roof, flooding the area with light, and the living wall will provide a dramatic entrance feature while reinforcing the concept of the dwelling integrating with the landscape and providing a natural balance to the hard materials of the dwelling. On the first floor, three bedrooms are configured around the rear North East corner of the site, with terraced areas and substantial glazing to the two main bedrooms, providing additional private external space and maximising the views over Preston open countryside. The surrounding roofs, over the swimming pool, gym and servicing areas step down from the terraced areas and features a floating natural wildflower green roof, with minimal edge treatment, providing the illusion of a continuous landscape feature. Materially the dwelling is intended to have a limited palette of materials, reflecting the surrounding Preston area, comprising render, timber and natural stone. It was felt that a contemporary approach to the dwelling was appropriate although key influences have been taken from the surrounding Preston area and it is proposed that the resultant dwelling will provide high quality, sustainable and complimentary building to Wrea Green, Preston. Features: Contemporary family room, basement parking, swimming pool, leisure complex, balconies, backland development.